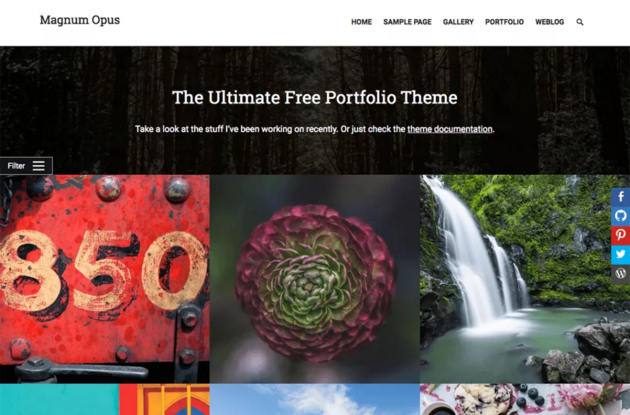 Free WordPress themes have come a long way, and free WordPress portfolio themes are no different. They come with more than enough features photographers need to build a well-optimized portfolio site designed to attract and acquire new leads and clients. They come with portfolio post types, fully-featured landing pages, galleries and more. 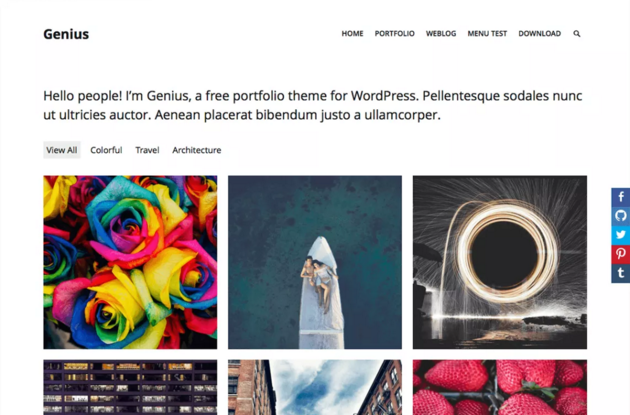 What Features Do Optimized WordPress Portfolio Themes Have? WordPress portfolio themes come in all shapes and sizes. Some are optimized specifically for photographers while others can be used for a variety of different industries. 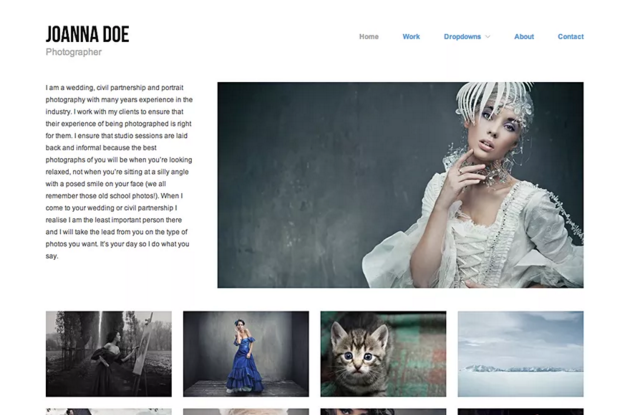 There’s one thing every portfolio theme should have when it comes to using WordPress to build a portfolio site for a photographer, and that’s style. Photographers are creative professionals. They capture memories, locations, emotions, historic moments and more. Each and every one of these photographs tell a story in an incredibly simple and visual way. They use the best equipment they can get their hands on, do their best to set shots up just right and spend a considerable amount of time editing the image until it’s just done. They need a portfolio design that complements their style. They need their images to be surrounded by a design that’s true to the times, minimalist and just as stunning as their images are. They’re using their websites to attract clients, so they need to make a big impression as soon as a potential lead visits their site. Grid Layouts – Grid layouts have become an increasingly popular trend for portfolios and blogs over the last few years. They provide a way to display a collection of many images or projects in an aesthetically-pleasing way. Portfolio Custom Post Types – This custom post type allows you to create pages designed specifically for the use of individual portfolio items. Some custom post types can even have their own taxonomy system. Galleries – Some photography themes make great use of the gallery post type by allowing photographers to use their photos to create beautiful galleries. Business Elements – Photographers, whether they’re part of a creative agency or work on a freelance basis, create portfolio websites for business purposes. This is why you may also want to consider choosing a theme that has a call to action, a section for services, a contact form built on the homepage and other business elements. Be sure to check out our post 4 Good Examples of Pre-Built Portfolios for more business-oriented information on what a portfolio should include. 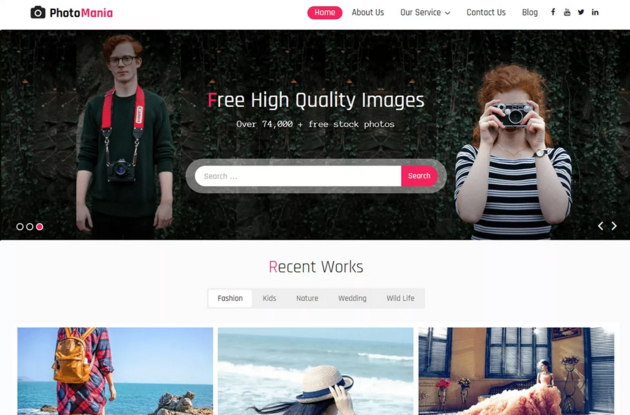 This post contains a list of just over 25 best free WordPress portfolio themes for photographers. They all contain at least one feature listed above. Some even contain several. 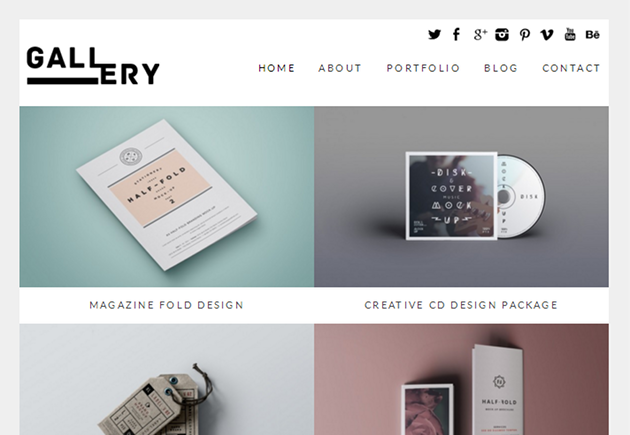 If you’d prefer to check out a post that lists portfolio themes that can be used by a variety of different creative types, check out our list of 10 WordPress themes for designers. 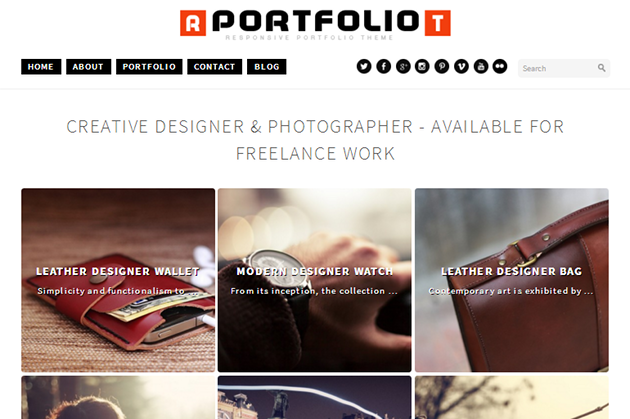 Without further ado, here are 25+ free WordPress portfolio themes. 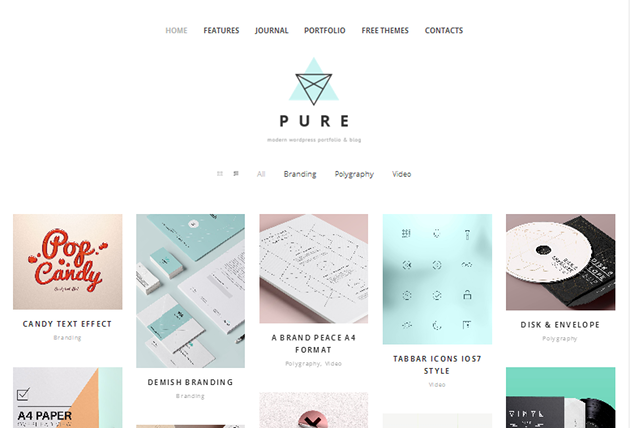 Pure displays your portfolio in a masonry grid layout on the homepage. This portfolio can even be filtered by category. 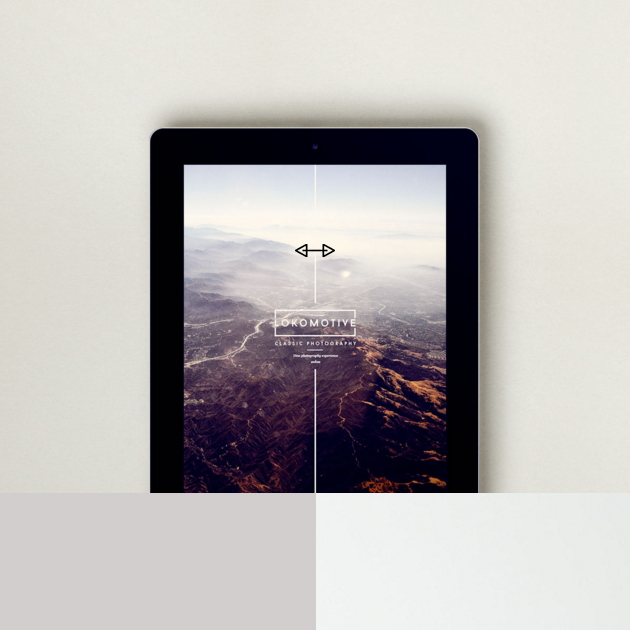 Gallery uses a minimalist design to display your portfolio in a grid. Visitors can even flip through your portfolio page by page. 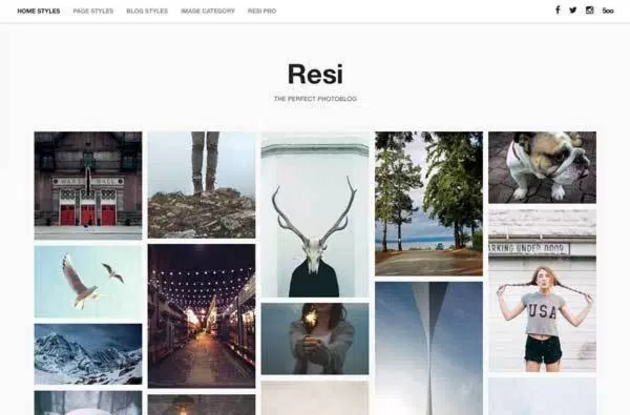 Resi is a simple portfolio theme that displays your work in a grid layout on the homepage. It allows you to add portfolio items through the use of the image post format. 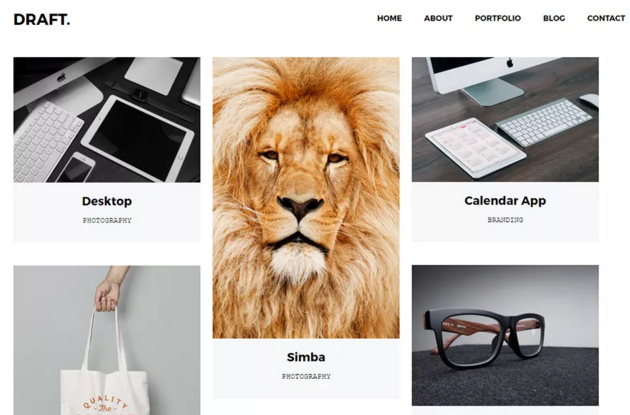 Draft Portfolio is another simple, minimalist portfolio theme that displays your work in a masonry grid layout. Each portfolio item is captioned with its title and category. 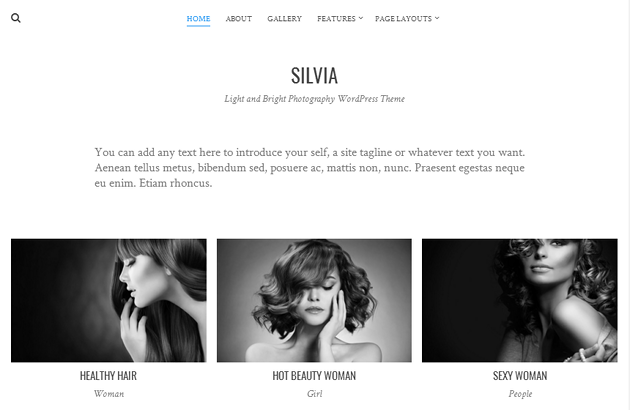 Olevia is another portfolio theme that displays your work in a masonry grid layout. This one is a tad more minimalist than the previous themes. 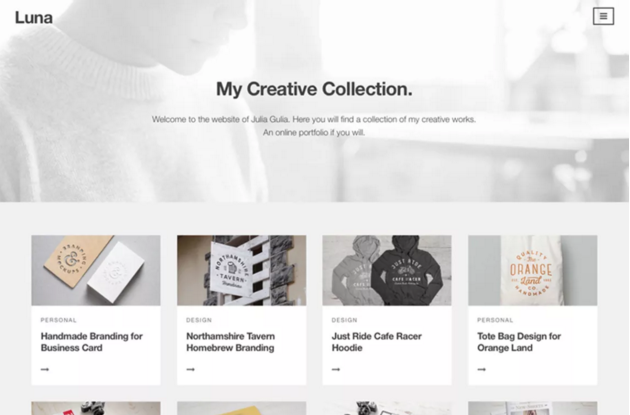 Luna is a portfolio theme for creatives. It features a large header you can use to introduce yourself and displays your work in a simple portfolio with minimal details. Screen is a portfolio theme that displays each item in your portfolio as a slide. All of these slides make up a large slider that displays on the homepage. 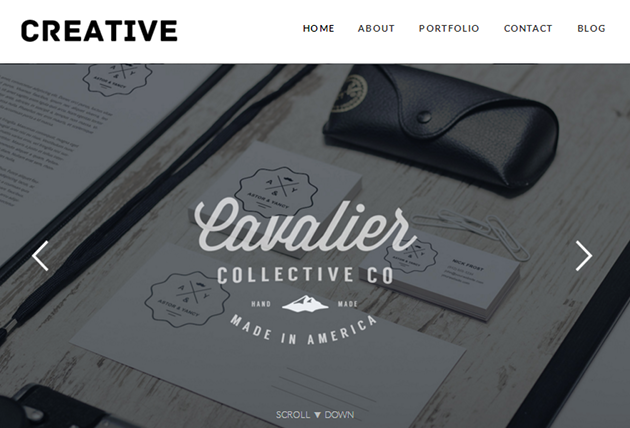 Creative is a portfolio theme for creatives. It features a large slider to display your work at the top of the homepage and displays the rest in a grid layout. 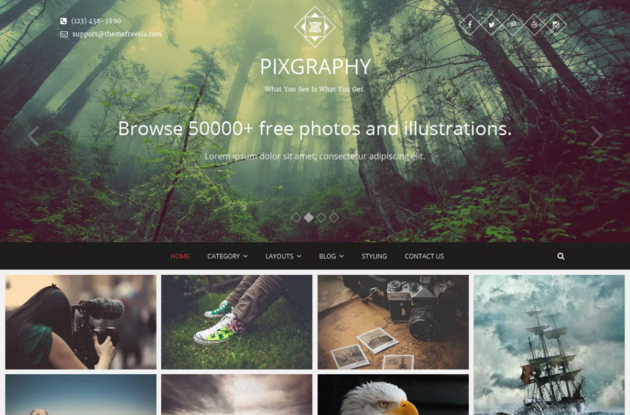 Pixgraphy is a simple yet stunning portfolio theme that displays photos you choose to feature as a slider in the header. The rest is displayed in a grid layout. 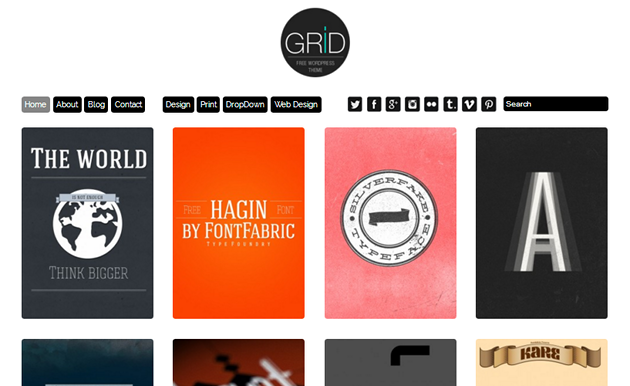 Grid is a portfolio theme intended for graphic designers. However, its use of portrait thumbnails makes it a great option for portrait photographers. 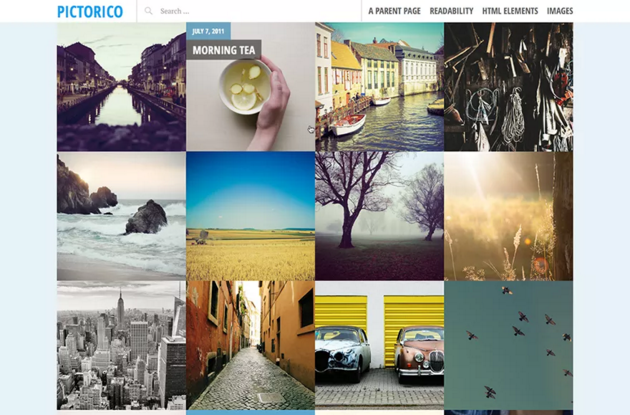 Pictorico is a simple portfolio theme that displays your work in a grid layout. It also comes with a post slider. 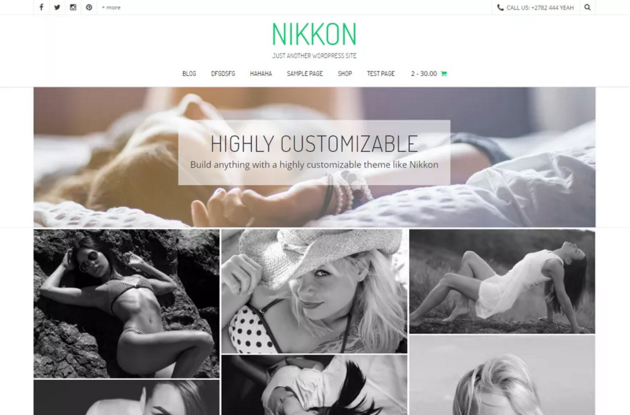 Nikkon is a creative multipurpose theme that can be used as a portfolio theme for photographers. It displays your portfolio in a masonry grid on the homepage. 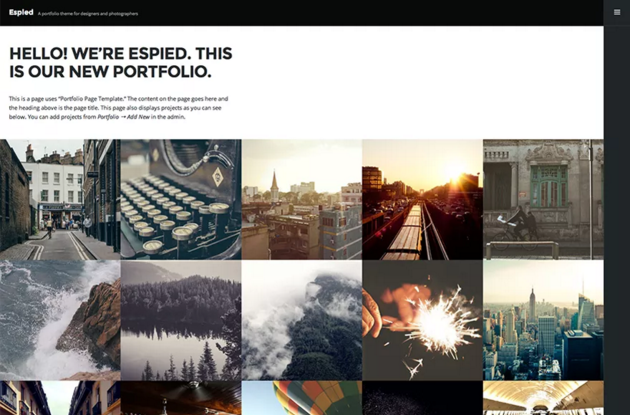 Espied is yet another simple portfolio theme displays your photos in a simple grid layout. It comes with a portfolio page template. 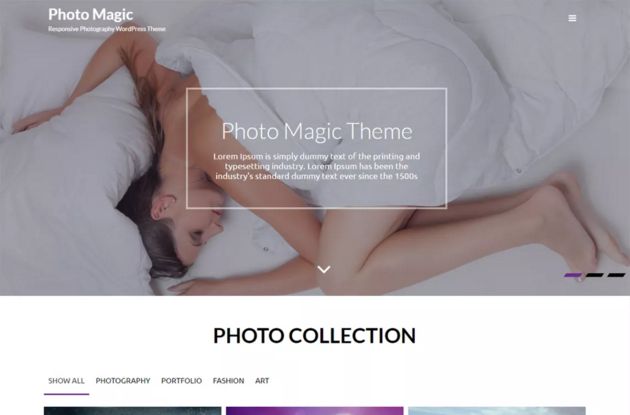 Photomania is a dedicated photography theme that uses a portfolio displayed in a masonry grid layout on the homepage. Your work can be filtered by category. 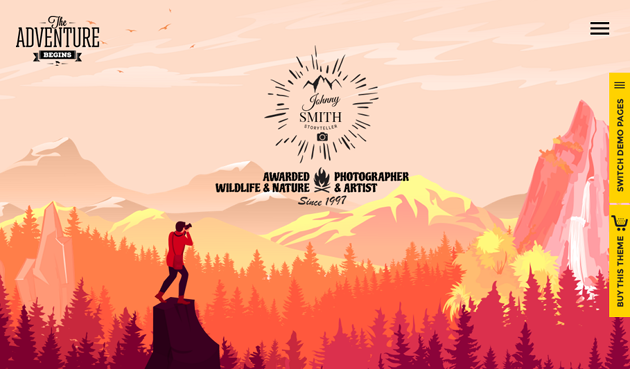 Artwork is an aesthetically-pleasing creative theme that uses a parallax-scrolling effect and features designated sections for your portfolio. FotoGraphy is a dedicated photography theme with a number of different business elements. It also displays your portfolio on the homepage in a masonry grid layout. 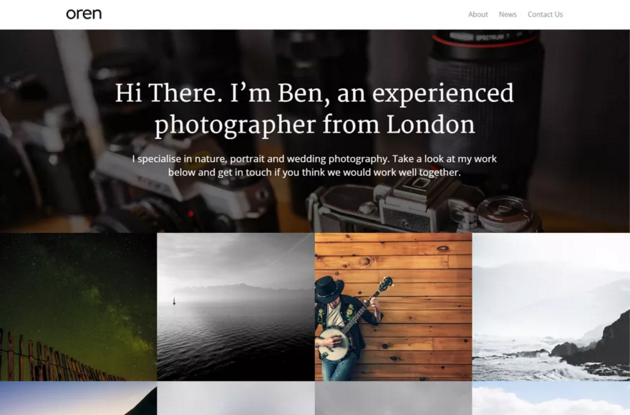 Oren is a simple theme that uses an introductory header and grid portfolio layout. Its design heavily depends on the quality and style of your images. 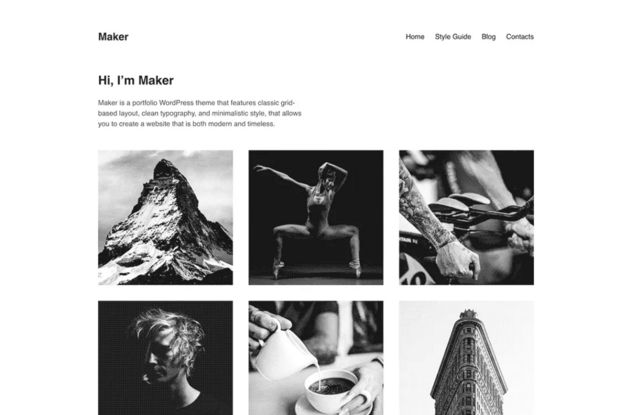 Maker is a minimalist portfolio theme that displays your work in a simple grid layout. It combines modern trends with timeless designs. 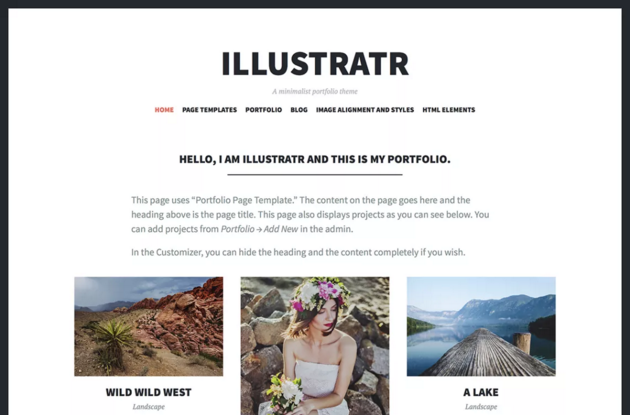 Illustratr is a minimalist portfolio theme that displays your portfolio in a grid layout where each item features its title and category. It even comes with a portfolio page template. 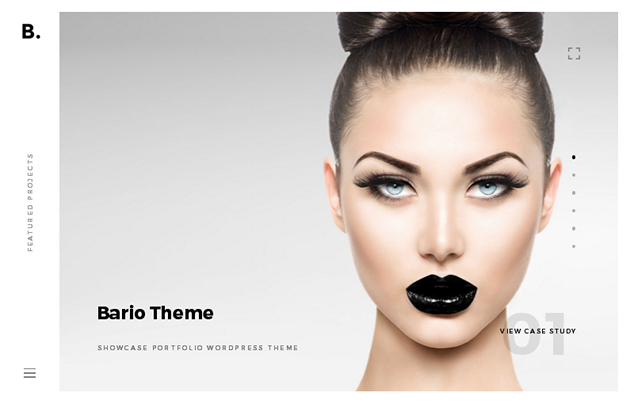 Magnum Opus is another simple WordPress theme designed specifically for portfolio websites. Your portfolio can be filtered by category, a feature hidden behind a hamburger menu. Genius is another minimalist portfolio theme that uses a grid layout to display your best and/or latest work. This layout can be filtered by category. 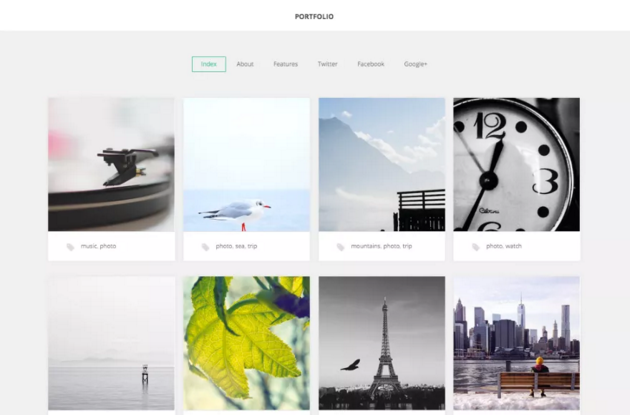 GK Portfolio is a dedicated portfolio theme that uses a grid layout. It can be filtered by category, and each individual item displays its tags. 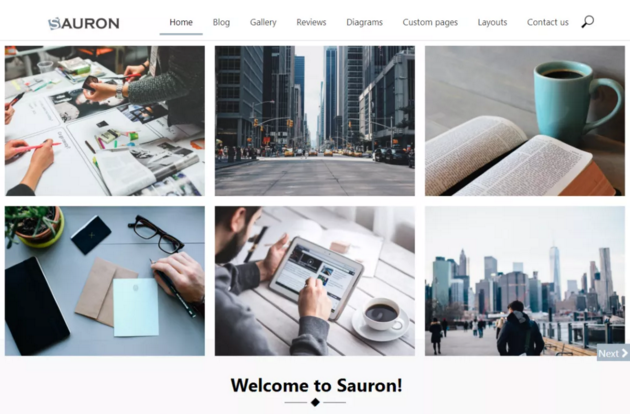 Sauron is a business theme designed for creative professionals. It features a grid layout of your portfolio at the top but features typical business elements underneath. Electa is a simple portfolio theme. It uses a classic blog-style, left-hand sidebar menu and displays your portfolio in a grid layout. 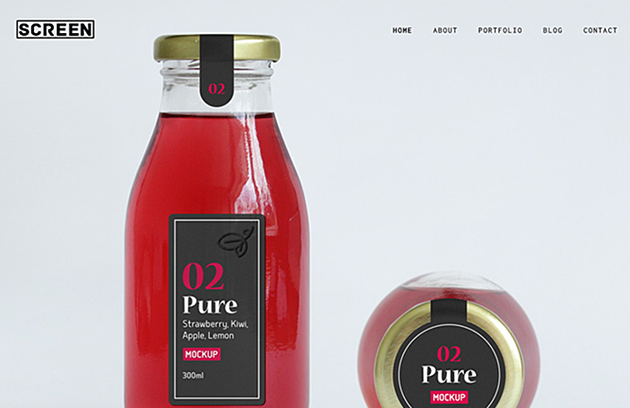 Hatch is a minimalist portfolio theme that displays your work in a standard grid layout. It also features an About Me section on the homepage where you can introduce yourself. Responsive Portfolio displays your portfolio in a grid layout with an overlay of titles on each individual portfolio item. 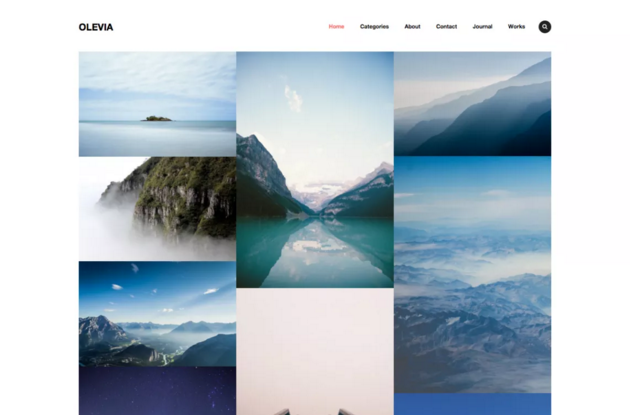 Silvia is a minimalist photography theme with a simple yet effective design. It displays your portfolio in a grid with each item’s title and category attached. PhotoBook is a dedicated photography theme. It comes with a grid portfolio layout, but you can also use a call to action in the header. Photo Magic is another dedicated photography theme. It uses a grid layout for your portfolio, which visitors can filter through, and includes a slider in the header. 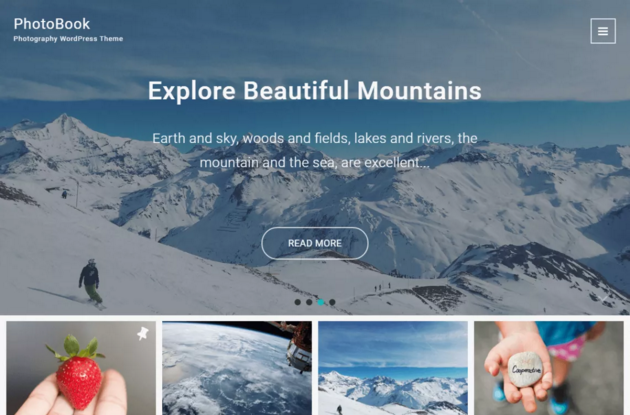 Portfolio themes, even free WordPress portfolio themes, have among the most elegant styles in web design, so elegant, you may have a tough time picking one out. Try thinking of how many truly spectacular images you or your client has. You may want to pick a theme that uses a grid layout with numerous items if it’s a large amount. If you only have a handful of images, use one that gives you an area to feature your best work but also has a grid layout you can use to display additional work. 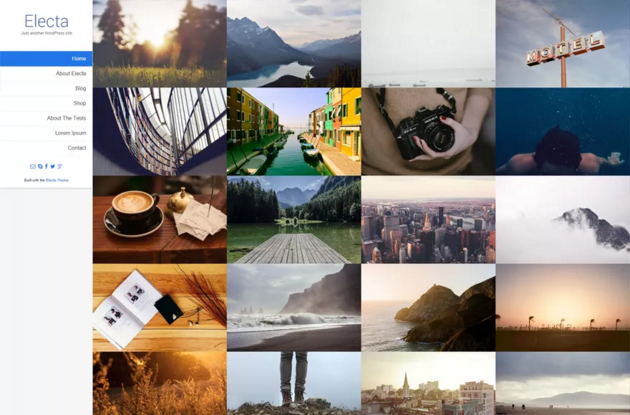 If you’re looking for more photography-oriented themes, check out our round up of the best photography themes. These are some of the most amazing simple themes. Thanks for your effort finding them.